A mapcap drama about an inept actor who switches places with an erudite, hardened criminal. 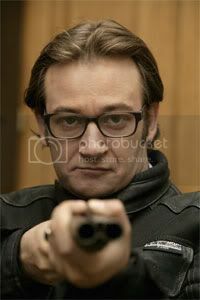 George McCabe (James Dreyfus) is an infamous career criminal who currently resides at a maximum security prison. Lawrence Nixon (also Dreyfus) is a struggling actor; the only thing he has going for him is the fact that he is the spitting image of McCabe. The result: Lawrence’s big acting break starring in a TV reconstruction of McCabe’s notorious downfall. The trouble is Lawrence’s acting ability is sadly lacking, so in a desperate attempt to breathe life – if not accuracy – into his portrayal of McCabe, he unwisely embellishes his performance with a menacing lisp and a camp walk. Inside the prison the real McCabe becomes a laughing stock, and vows revenge on Lawrence.